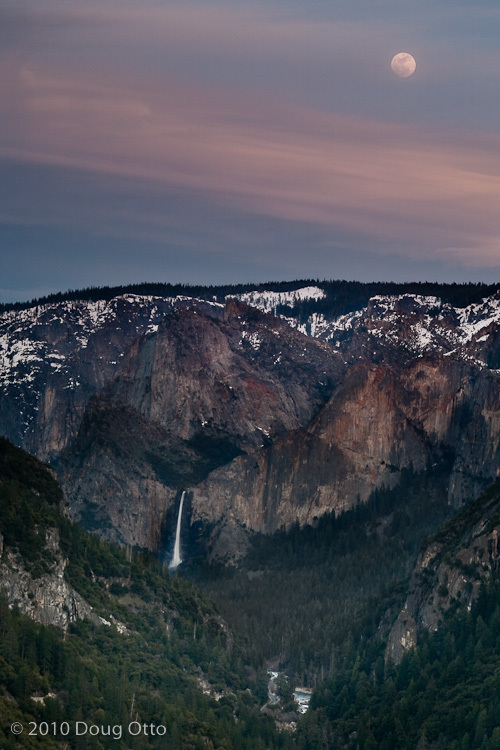 Even when a workshop isn’t involved, the position and timing of the moon influences my planning a Yosemite visit. Visually it’s very a strong element, but it can also be a primary light source for night shooting. Having it in the sky, and knowing where it’ll be, can help make the most out of a photo trip. Recently, on a photography forum that I frequent, there have been a bunch of heated discussions over the placement of the moon within a scene. For the sake of this article I’ll refer to the moon, but really it could be just about any component of the scene. One camp strongly insists that pasting in, enlarging or moving the moon to suit the image is merely [wikipop]artistic license[/wikipop]. The other side feels, just as strongly, that it’s neither creative nor artistic to artificially introduce objects into a scene. You probably have already guessed where I stand, especially when it’s done without disclosure. The later being the most serious as it damages the creditability of the entire photographic community. To me, the most interesting aspect of the discussion is motivation. I photograph, primarily, to please myself. If the photograph also pleases someone else that’s great but that thought never enters my mind while I’m creating it. It’s quite satisfying to have done the research, put yourself in the right spot and capture the image “in the wild.” I could have created this image any day of the year by pasting a moon into it from the comfort of my home office; but I didn’t. It’s a single exposure, made with a Singh-Ray graduated split neutral density filter. [wikipop]Ansel Adams[/wikipop] was a master of the darkroom. Even though he spent days producing a single print I can’t imagine anyone walking up to him, at an exhibit, and saying: “You didn’t develop that did you?” It’s clear that the credibility of digital has already taken a hit. While an amazing piece of software, it’s my fear that things like “content aware fill” in the new Photoshop CS5 will just further that divide. Only time will tell. This entry was posted in Photography and tagged Canon 100-400, Canon 5D, doug otto, graduated neutral density filter, Photography, yosemite, yosemite national park. Bookmark the permalink.